As Frank van Meel describes it, Audi's approach to electric vehicles is supremely rational. On the other hand, van Meel adds, the company really likes the idea of an electric sports car that "goes off like a catapult." Van Meel, the brand's head of electromobility strategy, says both qualities are essential: Capturing Audi's brand image requires something other than a drab eco-mobile. What Audi is after, he says, is "more or less the 'Wow!' effect -- 'I didn't know it could be that cool.' "
That was apparent when Audi started showing E-tron concepts with the EV sports car it rolled out at the 2009 Frankfurt show. That sleek, futuristic two-seater, which was derived from the R8 high-performance sports car, used four in-wheel motors to hit a 4.8 second 0-60 time. "We said our brand image is to have sporty, progressive cars," van Meel said in an interview at the Geneva auto show. "The E-tron was exactly that." Van Meel, a 44-year-old native of the Netherlands, came to Audi in 1996 from ITT Automotive Europe. He managed several engineering projects at Audi before taking on the electromobility role in 2009. Audi will stick with the "wow" factor when it launches its E-tron line with the R8-based sports car next year. But as Audi seeks to fill out its lineup of electrified vehicles, it will be painstakingly methodical. 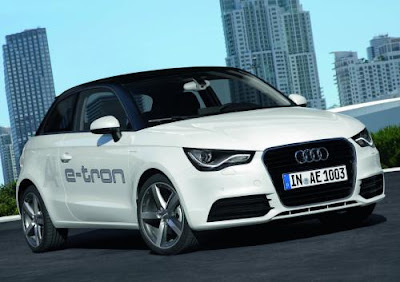 The first step in that process comes this summer, when Audi begins testing A1 E-tron subcompacts in Munich. Using smart phones, Audi will track the "typical mobility behavior" of project participants before they get the A1, then assess changes as they use the car. "We monitor their mobility behavior in the car, by bike, by foot, subway, whatever," van Meel said. "Then they change to the A1 E-tron, and we have a look to see if they still have the same mobility behavior or it if changes." The A1 E-tron is a range-assisted EV that has a small internal combustion engine, which serves as a generator that recharges the battery. Audi showed the car at the 2010 Geneva auto show, referring to it then as "a near-series production vehicle." Audi initially will retrofit existing vehicles as EVs, then move to vehicle platforms designed for electric drive, he says. Van Meel says Audi's study of consumer habits will shape the E-tron lineup. But he adds that government policies will play a major role. As an example, he cites the Chinese government's ban on gas-powered scooters in Beijing, a dictate that will put 800,000 electric-powered two-wheelers on the streets there. More broadly, van Meel says, the sprawling urban centers of the future could restrict internal-combustion vehicles. Today, though, consumers need to see benefits from EV ownership. "It's a question of incentives, it's a question of legislation, but it's also a question of 'Can I use car-pool lanes, bus/taxi lanes? Will there be preferred parking spaces? Will there be shopping malls with free charging?' " van Meel says. "Then, from the customer's viewpoint, it gets more interesting." Of course, taking off like a catapult could make things interesting, too.